This is a replica of the British Museum image of Tara. The unadorned, yet aesthetically pleasing image, wears a high hair-do, at the centre of which is an empty socket. It may have contained a miniature seated Buddha statue traditionally associated with Bodhisattva images. 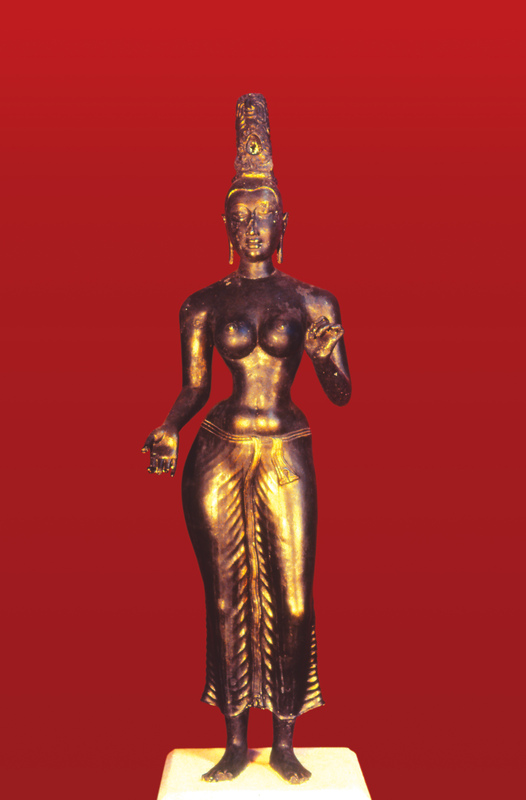 Originally found near Trincomalee, Sri Lanka, it is the tallest Buddhist female bronze image discovered in Sri Lanka and may represent an instance where Tara was worshipped in her own right as Bodhisattva. Various dates between the 8th and 10th centuries A.D. have been suggested by scholars. This replica is found in the National Museum, Colombo. Sirima Kiribamune, "Tara, a replica," online in Digital Library for International Research Archive, Item #12502, http://www.dlir.org/archive/items/show/12502 (accessed April 18, 2019).